Which trees should I build my treehouse in? 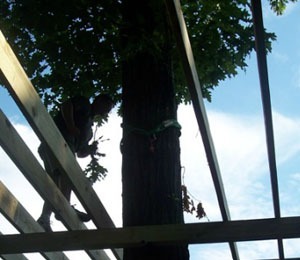 The presence of a disease or an injury does not disqualify a tree as a location to build your tree house, but it might mean that the tree warrants further investigation and possible treatment before, during, or after building the treehouse. Trees have a limited amount of energy that they can use for structure and defense. So, if the tree is struggling with too much already, then the additional stress of adding a treehouse may tip the scale and cause the tree to spiral down the path of declining health. The age, condition, and environment of your trees should all be considered. Treehouse Attachment Bolts, or TABs, are so strong that they don’t bend or break under normal circumstances, but under high loads, they can still compress the wood tissue of the tree, which we call failure even though the treehouse may not appear to be sinking or falling from a distance. Because the crushing strength of the wood is the limiting factor, a hardwood tree like an oak, hickory, walnut, or cherry will support more than a pine, spruce, yellow poplar, cedar, or redwood. This doesn’t mean you can’t build your treehouse in a tulip poplar or white pine: it just means that you should choose the right tree house fasteners or perhaps design a lighter weight tree house or even just a tree platform. One arborist we know likes to say that if you have a beautiful specimen tree that you love, don’t build the treehouse in it; build the treehouse in the next tree over with a view of your favorite tree. It makes a lot of sense, when you think about it. Tree house construction and the environmental side effects of construction both damage and stress trees, no matter how much we work to minimize those effects. Keeping that in mind, perhaps it’s better to avoid building in specimen trees and build in the next ones over that may be more expendable. Your tree house is going to introduce several environmental changes that will affect your trees. Perhaps the most important to prevent is foot traffic. Foot traffic will compact soil and should be confined to a few well traveled paths if possible, with barriers and wood chips spread around if possible. Please remind children and guests that the tree is the giving host for their tree house and activities such as peeling bark, carving initials, smacking the tree with sticks, etc is not respectful or kind to the tree. It is also critical to remember that tree roots often extend 2-3 times farther from the trunk than their branches do, so think carefully about any digging, tree removals, or other environmental changes that are close to your treehouse tree. If you don’t know much about evaluating trees (or even if you do), it is a good idea to have your trees assessed by a professional. First, they will need to see the trees. If they pass the visual inspection without red flags, then that might be it. If there are concerns, then further analysis and testing may be recommended (which is more time consuming and expensive), or you can choose different trees. We can assess your trees for you, and we recommended that, especially if the distance doesn’t require multi-day travel. If you are far away, then it’s probably better to start with a local ISA Certified Arborist. Be prepared to pay about $100 – $250 for a tree inspection from a local arborist. Let us know if you need a referral, or check the ISA Website to look up Certified Arborists in your area. After that, then send all information gathered during the inspection to us and we’ll be able to use the evaluation to guide our design for your treehouse.